Don't miss your chance to see the biggest country line-up of the year! As the one and only – Florida Georgia Line, Nelly & Chris Lane ALL come to perform a live and exciting show at Oak Mountain Amphitheatre on Thursday 19th October 2017! Tipped to be the most talked about events of the entire year, Florida Georgia Line, Nelly & Chris Lane will be bringing classic tracks along with brand new material to the stage… There are still tickets left, but don't delay – it's going to be an unmissable night and bound to be a sell out show!!! Florida Georgia Line really need no introduction as one of the most popular touring Country acts, these guys create an impressive sound with just the two of them as the front singers and a band to back. Each show gives an insight to just how talented they are, getting the crowd pumping and jumping, with their chart topping hits. Get ready to experience it all this Fall – book your tickets for a venue near you and be a part of just that… as the show ends, you will be left wanting more! 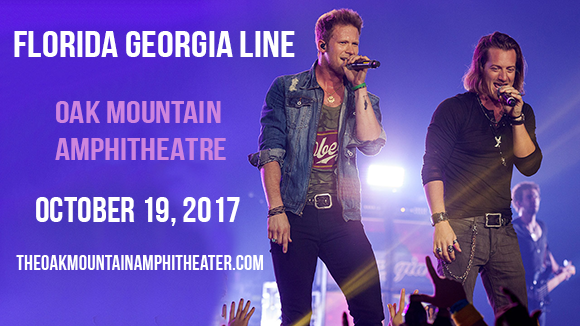 This is the only place to be so grab your friends together, if country is your passion – Florida Georgia Line will deliver!